MARY JENNIGES, age 92, of Ellsworth, died Monday, June 25, 2018, at the Parkview Manor Nursing Home in Ellsworth. Mary Ann Moran was born on December 15, 1925 to John and Alvina (Kruse) Moran in Ellsworth MN. She was baptized and confirmed at St. Mary Catholic Church in Ellsworth. 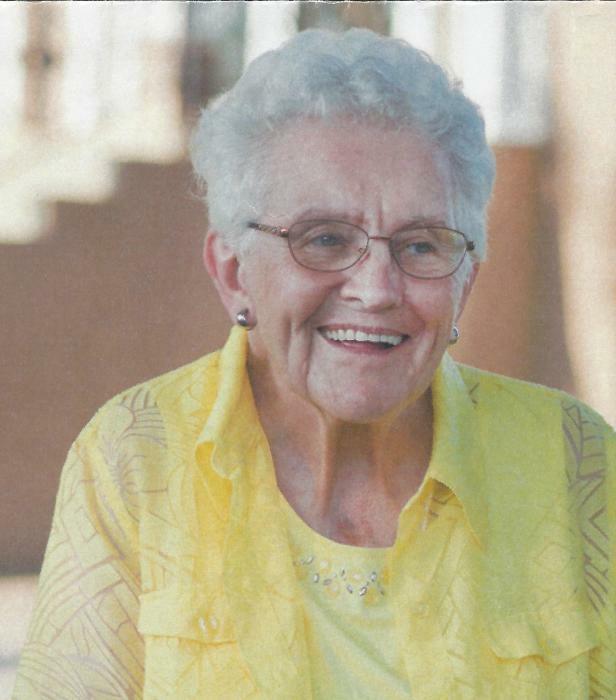 Mary attended country school and later St. Mary Catholic School graduating in 1943. After graduation, Mary attended Teachers College in Mankato, MN. After receiving her teaching certificate, she taught school in Wanda, MN where she met Valentine Jenniges. Mary and Val were married at St. Mary Catholic Church, in Ellsworth, on September 23, 1948. They lived for a time in Wanda where Val farmed and Mary taught at the Walnut Grove school district. They moved to Ellsworth to work on the land Mary grew up on. Mary taught school at a small country school in Iowa and then at the Ellsworth Public School. Mary and Val were blessed with fourteen children. They taught their children the values of life through their own example. Mary volunteered at Parkview Manor fixing hair, and leading the Stations of the Cross during Lent. She also delivered meals on wheels for many years. Mary enjoyed working in her garden, canning, bowling, and playing cards. She was an avid reader and an excellent seamstress. While she probably didn’t enjoy laundry day, she did enjoy instigating water fights on laundry day – though she would never admit it. Mom was especially proud of getting here ten gallon pin for donating blood – starting late in life. Mary is survived by her fourteen children, Loretta Froyum, Nancy (Ray) Watson, Tim (Sharon) Jenniges, Mary Beth Buchholz, Joyce (Dave) Potter, Ted (Vickie) Jenniges, Amy (Dennis) Boyenga, Janelle (Jerrold) Folkens, Ray (Julie) Jenniges, June (Steve) Cox, Anne (Keith) Brown, Kay (Tom) Miller, Greg (Julie) Jenniges and Celene (Jary) Holst. Forty three grandchildren and many great-grandchildren, she loved them all, and they all loved and spoiled her. She is also survived by a sister-in-law, Jean (Bill) Deutsch. She was preceded in death by her husband, Valentine Jenniges; grandson, Dustin; her parents, John and Alvina Moran; two sons-in-law, Jim Froyum and Leonard Buchholz; and seven siblings, Dorothy Moran, Robert Moran, Bernice Linssen, Marjorie Ross, Jason Moran, Catherine Gacke, and Jean Lonneman. Mom’s passing leaves us with one unanswered question: Did she really like the green lifesavers OR did she choose green so the rest of us could enjoy the orange and the red? Visitation will be from 4-7 pm Friday, with parish prayers at 7 pm, at St. Mary Catholic Church in Ellsworth. Visitation also one hour prior to the service at the church on Saturday. Funeral Mass will be Saturday at 11:00 am at St. Mary Catholic Church, in Ellsworth, officiated by Fr. Thomas Jennings. Burial will be in the St. Mary Cemetery. Dingmann Funeral Home, in Adrian, is in charge of arrangements.